Starting January 1st, 2010 Up The Ra! will open membership to all. Any political orientation will be allowed. There will be zero tolerance for trolling and blatant attacks on anyone. Republican Socialism - The ONLY Working Class Alternative! Our flag is the Starry Plough. Our Class is the Working Class. Our enemy is Foreign Imperialism and Native Capitalism. We are the IRP's. Here we are and here we will remain until Ireland becomes a socialist society in the image of Connolly, Mellows and Costello. has many applied to join this republican forum so far? Speaking of which, I'd suggest looking through the membership list and noticing how many have joined since January last year -- and how many of those have ever posted anything at all. Quite enlightening. Provos are welcome to join and debate on here. There never offically was a "no provo" policy. When elle became a mod, she drove away those whom she disagreed with, and banned many for no reason. This forum went downhill fast because of her, and also due to myself neglecting this forum. By opening up the forum hopefully old friends will come back and that some new ones join. I think peace lovers would know (assuming they know about members of this site) that they wouldn't be very welcomed by certain people. But hey, they aren't even interested in talking with the groups carrying on the fight, they made that quite clear when they denied to talk with the Real IRA in march, so it's their fault. Last edited by TheBoondockSaint9mm on Sat Jan 09, 2010 12:37 am, edited 1 time in total. "Oglaigh na hEireann will continue to strike at the British occupation forces when, wherever and whenever we decide." To all new forum members....''Welcome to the Jungle''!....I'm the quiet one. BISCUITS wrote: To all new forum members....''Welcome to the Jungle''!....I'm the quiet one. Aallowing Sinn Féin members/supporters to register with the Up The Ra! Forum will encourage a lot more interesting debates - maybe we'll even be able to "re-convert" some of their members/supporters into being Republicans again. Last edited by Costello on Fri Jan 15, 2010 1:00 am, edited 1 time in total. "I owe my allegiance to the working class." !! 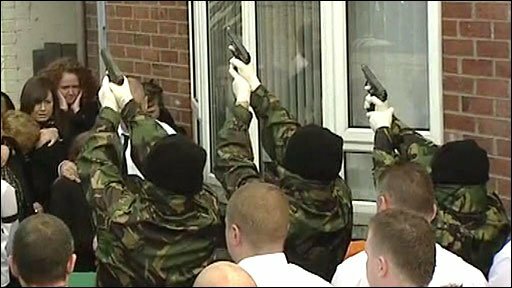 FREE ALL REPUBLICAN PRISONERS NOW ! !